Michael Mule prepares to slap up Alex Rotmans after scoring the go-ahead run for Greece Post on Friday night. (Photo: BILLY HEYEN). GREECE, N.Y. — Greece Athena has held its graduation on Saturday in the past, said Greece Post head coach Dan Ford, so he never considered checking to be sure it was still then. Tuesday, he learned the graduation would be Friday at 7 p.m., beginning an hour after Greece Post’s Friday game began. Four of Greece Post’s players would be walking the stage on Friday at the Greece Central Performing Arts Center instead of on the field at Greece Arcadia, and the home team was missing a few guys due to work, too. That put the 10 remaining Greece Post players in unusual spots. Multiple guys that are more or less pitchers-only found themselves in the batting order. A shortstop caught the last inning. The starting pitcher, not normally an infielder, played the final inning at second. Faced with a lack of bodies and a less-than-optimal lineup, Greece Post held on to beat Wayland Post, 3-1. Neale McMullen pitched six innings, allowing six hits and one run, to earn the win. 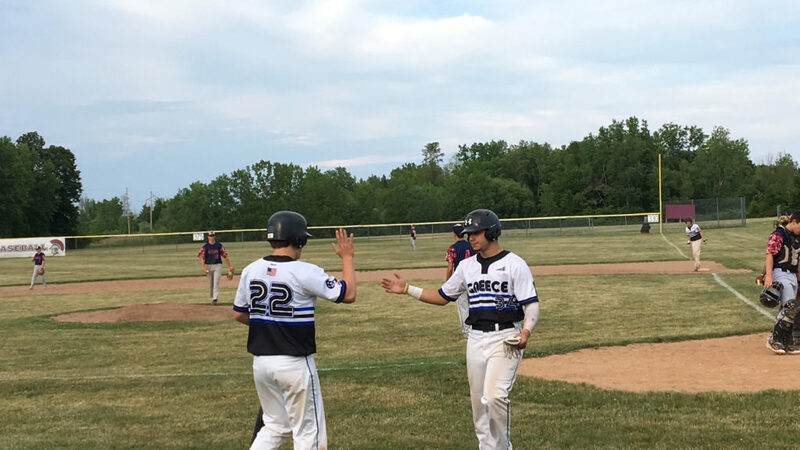 Isaac Yorkey and Jake Wamser delivered run-scoring hits. And Greece Post overcame four starting bats’ absences to grind out a win. McMullen didn’t start off the game well. After Greece Post threw a combined no-hitter on Wednesday, McMullen threw two balls to start the game and then allowed a leadoff single. Two batters later, a fly ball down the left field line resulted in a double and a run for Wayland. From there, McMullen settled down. He noticed that the Wayland hitters were sitting on his fastball early on. So he went with his curveball more frequently the rest of the way. His mix of pitches resulted in seven strikeouts across six innings. Greece Post got the run right back in the bottom of the first. The first two batters made outs, but then James Huber walked on five pitches and moved to second on a wild pitch. That’s when Yorkey delivered with a liner over the second baseman to tie the game up. Wayland starter Benjamin Wood matched McMullen with zeros in the second and the third. But unlike McMullen, Wood couldn’t put up another in the fourth. Michael Mule stood on second after reaching on a fielders’ choice and moving up on a passed ball with two outs. Wamser, the eight hitter who Ford said more often than not doesn’t hit for Greece Post, stepped in. Wamser was looking for a belt-high fastball, he said. He didn’t get it on the first pitch, as the ball was heading up and in. Wamser didn’t wait to see if it would come on the next pitch, though, as he lined the ball into center field to score Mule. McMullen had reached via a walk ahead of Wamser, and following Wamser’s knock, he stole third with two outs, oftentimes a high-risk, low-reward proposition. But he made it standing up and it worked out for Greece Post, as a wild pitch brought McMullen home for the final margin. As Ray Mineo took the mound to close out the game for Greece Post, the graduation ceremonies of Greece Athena High School were in full swing. When the final out was made at approximately 7:40 p.m., a livestream of the Athena graduation showed the commencement speaker addressing the attendees. Four Greece Post players graduating Friday were there listening. Their Greece Post teammates, an eight-minute drive away according to Google Maps, made sure to come through in their absence.